Changes to EFG Sailing Arabia – The Tour 2017 are set to broaden this unique annual race’s appeal with the announcement of a new route and the launch of attractive campaign packages for new teams. Five offshore legs, starting in Oman’s capital Muscat and finishing 763 miles later in Dubai, combined with three in-port showdowns in Oman, Doha and Dubai is likely to make Arabia’s leading offshore race one of the most competitive yet, confirming its status as the most highly regarded sailing event in the region and a recognised tourism platform for showcasing the Gulf and its maritime heritage. In response to the extensive feedback collected after each edition, teams can now invest in turnkey campaign packages from event organisers Oman Sail, comprising bespoke branded Farr 30s, on board safety equipment, communications and logistical support and even a crew if needed. According to Dee Caffari, the Volvo Ocean Race sailor who skippered the first women’s entry in EFG Sailing Arabia – The Tour in 2012 and has now competed in four editions, this opportunity has immediately created more interest among teams who have never sailed in the region before. So in February 2017, the fleet of identical Farr 30s crewed by a mix of professional and amateur sailors will gather in the warm waters of Muscat where they have up to five days of training before opening their accounts in the first in port race at Al Mouj. They will then head north on the first overnight leg (105nm) to Sohar where the International Maritime College will once again host a day of culture, entertaining the teams with Omani food, dance and ancient traditions. The second leg (140nm) takes them through some of the most spectacular coastal scenery in the Middle East, as they pass rocky mountains dropping directly into fjords to Khasab, the capital of the Musandam Peninsular which made its debut on the Tour last year. It will be back to sea for the testing 153nm snakes and ladders course to Abu Dhabi before the penultimate leg (160nms) to Doha for a chance to cause an upset in the second set of in port races. The final leg to Dubai is the longest (205nm) and with chances for point scoring running out, likely to be the most intense though the final round of in port racing could easily prove to be the decider. Three times EFG Sailing Arabia – The Tour winner Sidney Gavignet makes no secret of his passion for the race and is set to return to defend his 2016 title. “One of the things I enjoy most about the SATT challenge is putting a team together because to compete successfully over 10 days of intense one design racing requires a certain type of sailor,” he said. For entrepreneurial teams, the networking and business opportunities are far reaching with guest sailing opportunities, VIP Hospitality, networking events and large scale media support with US$ 6.95million total media value achieved in 2016. “This is not just a sailing regatta – it is so much more,” said Fahad Al Hasni, skipper of the all Omani crew on Renaissance Services in 2016. “Even though the Straits of Hormuz are home waters to us, the challenges are huge and we learn something new every time we leave port. Each year, we feel like we are hosting new visitors and guests who are wanting to find out more about the countries in our region and our culture and that makes us very proud,” he added. 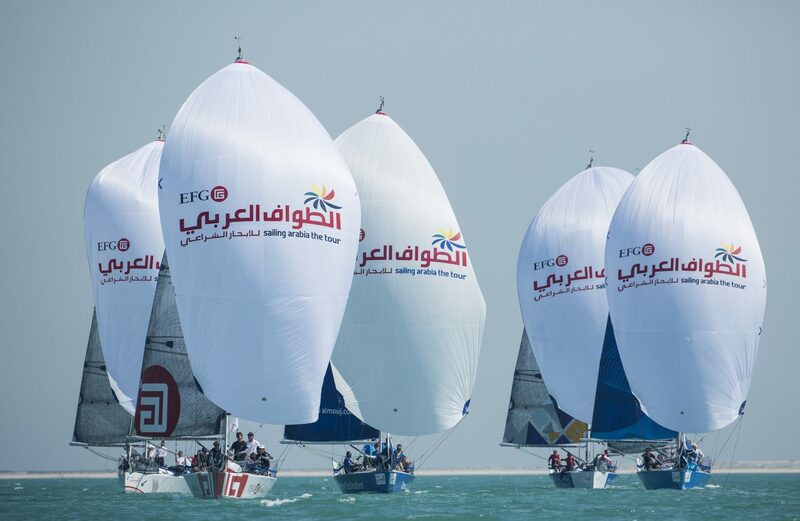 EFG Sailing Arabia – the Tour 2017 gets underway at the Al Mouj Marina in Muscat on 14 February 2017 and finishes with a prize-giving celebration in Dubai on 1 March 2017.